A fairly common vegetable in larger food markets and at the farmers market is Swiss chard. With its dark green leaves and rainbow colored stems, is slightly bitter, much like spinach. 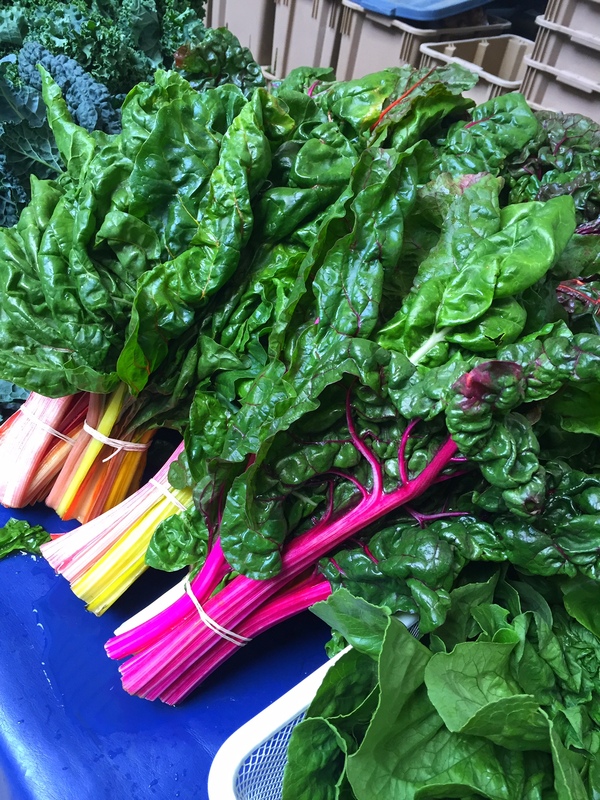 One cup of raw Swiss chard has only 7 calories, but here is where it pays off big for vegans and vegetarians – that same cup gives you 44% of your daily recommended intake of Vitamin A, 18% of your Vitamin C, 2% of your Calcium, and 4% of your iron. It’s also very high in Vitamin K.
When choosing your Swiss chard, look for glossy, healthy, semi-firm green leaves. They shouldn’t be blemished with a lot of holes, and they should stand up straight, indicating freshness. Avoid leaves that are yellowed or black. Stalks should be firm and not discolored or “bendy”. As for which color stocks to choose, they all taste the same. We’re including a recipe in this article, but for the most part you can really go wild an enjoy cooking with Swiss chard. The most important thing to remember when prepping your Swiss chard is to soak your leaves. Simply fill a large bowl or your sink with cold water and a little lemon juice or apple cider vinegar. Submerge your chard leaves and let it soak for 10 minutes. This encourages any little bugs or dirt particles to float away. Rinse well and get ready to cook. Shred the greens and add them to your mixed salad, just like you would with kale. Finely chop the stems and greens and add them to your vegetable stew or soup. Add a can of white navy beans, some diced onion, and your favorite spices to a pan with chopped Swiss Chard and saute until your greens are wilted and the onions are cooked. If you want to know how to cook Swiss Chard quickly and easily, this Swiss Chard recipe below will get you started. Want to know how to cook Swiss Chard? This recipe takes you through the basic steps for a great side dish or simple meal. 1. Wash your Swiss Chard very well and dry the leaves with a towel or paper towel. 2. Finely dice the stalks and slice or tear the greens into reasonably sized pieces. 3. In a large pot, add the oil. 4. Finely dice the garlic and shallots. If you do not have shallots, simply use onion. 5. Add the garlic and shallots to the oil and saute slowly until almost soft but not brown. 6. Add the Swiss Chard to the pot and stir. 7. As the greens start to wilt, add the salt and some pepper (to taste) to season. 8. Saute on low for about 10 minutes until the stalk pieces are very soft. 9. Add lemon juice in the final minute or so of cooking and stir well. You can add extra onion, more garlic or more lemon to this dish as you like. This is the base for so many great dishes. Enjoy!